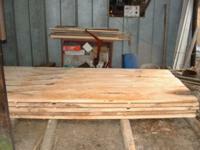 Operation: I am milling hickory to be used as flooring in my home. 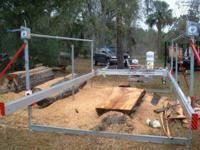 I also use my ATS as full-time employment milling urban hardwood trees for home owners in northern Florida and southern Georgia. Best feature: The sharpener is the best I have seen. Quick and easy, and back to milling! Tip: Find an energetic teenager to offload boards for you – the Peterson produces them too fast for my wife! 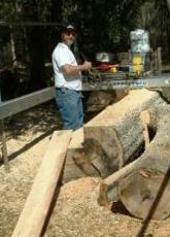 Motto: If it is too big for a bandmill, call me – I can mill it! 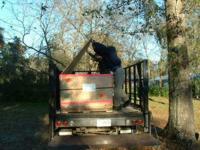 Like a kid on Christmas morning – the mill has arrived! 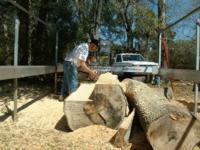 The first boards of hickory, milled up the day after Ken uncrated his mill. Ken sources logs that are too big for bandmills – but not for a Peterson. Ken is impressed with how little waste there is on the Peterson.